Neither chocolate nor flowers are the key to this woman’s heart. Sleeping under the stars—now that’s my love potion. Over the past seven or so years with my now-husband, driving up to a site for an overnighter has fanned the sparks in our relationship, from our first outing in Central California—complete with a naughty game of poker—to watching a sunrise over a Utah canyon. Each trip helps us reach new peaks, as individuals and as a team. Of course, outdoor getaways can become nightmares without proper communication and prep. (How many couples have gone off the rails over a stubborn campfire?) But if I’ve learned anything, it’s that tension eventually melts away once the flames are in full force, letting you bond over the beauty of your surroundings. 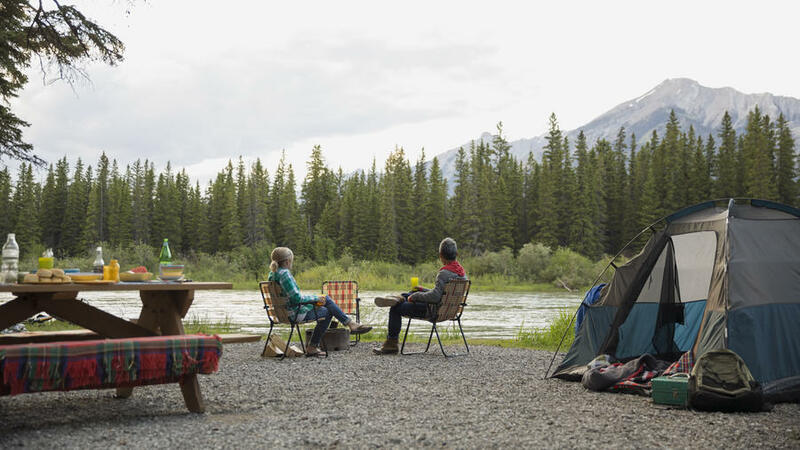 So for rugged romance without regrets, follow this tried-and-tested guide to car camping. Then sit back and let nature do the rest. 2 P.M. Leave work after lunch so you can set up before dark. Create privacy by pitching your tent behind boulders, bushes, or a picnic table. Layer a two-person mat with a double sleeping bag so you can spoon yourselves to sleep. GEAR: Klymit Insulated Double V, a super-comfy sleeping pad for two, $160; NEMO Tango Duo Slim down sleeping bag and camping quilt, $400. 6 P.M. Unless one of you is a former Eagle or Girl Scout, use a starter log, lighter fluid, or petroleum jelly–coated cotton balls (yup) to build a fire in minutes. 8 P.M. Cozy up after dark with a bottle of whiskey or wine (bonus points for a brand from a first date or an anniversary), and admire the galaxies overhead. Surprise your partner by pulling up The Night Sky or SkyView, two stargazing apps that tell you what constellations you’re looking at. 10:30 A.M. Study the map together to get on the same page about the agenda for the day, whether it’s bird-watching or skinny dipping. Pick a route that’s challenging but within your limits. Ample snacks mean no one will go hangry on the trail. 7:45 P.M. Up your dinner game with a dutch-oven stew simmered over an open flame. Afterward, a day of hiking is a good excuse to massage each other’s aching feet with lavender oil—just wash ‘em beforehand. 6:15 A.M. Catch the sunrise (the romance factor makes the early wake-up call worth it). Bring a blanket to an east-facing overlook and huddle together while soft pinks and purples break into blinding bright. Top it off with a couple of Irish coffees and toast a trip well done.